First 30 transcript pages are free for new clients. Valid for all rates. Transcripts should be scoped and clean before being submitted in PDF format for proofreading. If you need help converting your file to PDF, please let me know. Invoices are sent on the 1st of every month. Payment is due within 15 days of invoicing. 10% late fee applies after 15 days. All rates subject to change. Updated 2/27/19. Turnaround time starts when I acknowledge receipt of the job via confirmation email, Pacific time. Standard turnaround time for jobs received after 9 p.m. PT begins at 9 a.m. the next day, even if I send you a confirmation email before the 9 a.m. start time. This policy does not apply to expedite or rush services. If you require expedite service, please give me a heads-up early on so that I can confirm my availability. Please let me know ASAP if you require rush service so that I can confirm my availability. For all rates, business hours do NOT include Sundays, Thanksgiving Day, Christmas Day, or Fourth of July. Sunday deadlines are treated as Saturday deadlines. 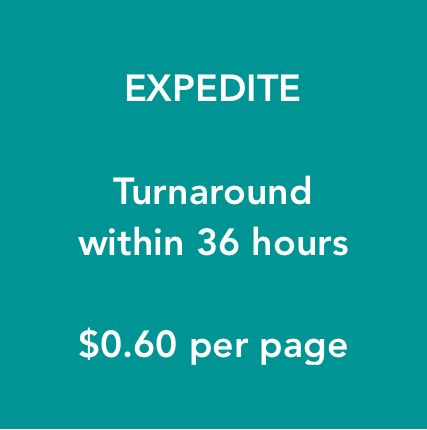 Turnaround time for pages sent to me on Sunday begins on Monday at 9 a.m. PT. Got a job exceeding 100 pages? Send it to me in 50-page chunks as you work on it. This helps me keep the turnaround time short for you. Accepted payment methods include PayPal, Google Pay, and credit card or bank payments via invoice. Ready for me to proofread your work?